First, one of my predictions that was made “pre-season” came true last week, unfortunately. 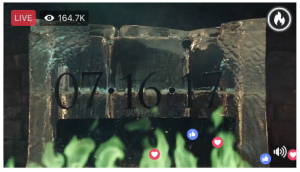 With that out of the way, let’s try to make some guesses at what might happen in the Season 7 finale. 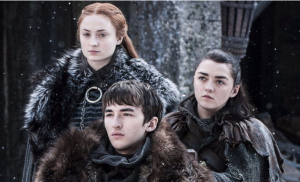 First off, what the heck is up with Bran? If he can see everything that’s going to happen, shouldn’t he be telling someone by now? 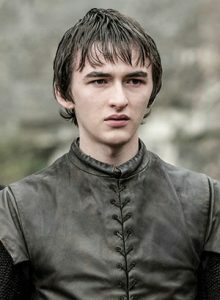 Side note: I have a wild theory that Bran is really Bran the Builder, having somehow transported himself back in time. He might even end up being the Three-Eyed Raven bound up in that tree…. You know, young Bran meeting the old version of himself? I’m having a really hard time coming up with any kind of story thread that would make that satisfying at all, because that would mean the whole show is a giant time loop, and that wouldn’t be fun at all. Probably make a lot of people really upset too…. And remember how Hodor reacted to Bran getting inside his head, and made Wylis convulse and become Hodor? What if Bran does more of this “traveling” and is the reason the Mad King went mad in the first place? And what about that grab that the Night King made for Bran? It allowed the Night King to waltz on by the enchantments and kill the Three-Eyed Raven. Wouldn’t that mean the Night King could just walk through any enchantments The Wall has? …Although, it appears now that everything is getting colder, he could just walk around the wall on the ice out on the water. Or maybe fly that dragon over it. Anyway, back to the finale. There are a few hints about what we’ll see in the previews. Grey Worm and a cast of thousands of Dothraki getting ready for battle, people looking worried on a ship, a meeting of the houses in what I presume is going to be some kind of parlay, probably to show off the wight they took with them. Cersei is so mad right now that even seeing a wight probably wouldn’t convince her. In fact, since Qyburn seems to be quite adept and keeping things alive (“The Mountain”), he might even try and convince Cersei the wight is a complete hoax. If that happens, about the only thing that could convince Cersei that the Night King threat is real is for that new dragon pet of his to come over and lay waste to everything. Might even kill Cersei, but I think it’s more likely Jaime will end up doing it because Cersei is getting a bit too dangerous. Especially with that warning she gave Jaime “Never betray me again”. Speaking of Cersei, did anyone else think that Sansa sending Brienne off the King’s Landing was a monumentally stupid idea? I mean, there’s no good at could come of that, because I’m pretty sure that by the time Brienne gets there, Jaime won’t be there to be on her side. What would Cersei do? Well, she’d send Sir Gregor after her right there on the spot. There would be a short battle and then no more Brienne. I mean, she’d put up a good fight, but in the end she’d lose. Now, if that does happen, (and I hope it won’t… I like Brienne), Jaime and Tormund would be mad. (Yes, I know..understatement of the year). Brienne might not think much of Tormund, but he’s going to go berserk if Cersei ends up killing her. Yikes… what will the landscape look like if Cersei considers this whole “parlay” thing a betrayal and kills Jaime and Brienne? That whole Sansa/Arya interaction was pretty weird. I’ve come to the conclusion that Arya just wanted to show Sansa she’s not the same little Arya as before. I think Arya’s going to go after Little Finger, and will end up killing him. Sam and Gilly are on the road. Bet Gilly still has that book with her, the one that listed the annulment. That’ll probably be the way that Daenerys and John find out they’re related. Not sure how Sam’s going to take the news that Daenerys had his father and brother burned. He’d probably be more upset about his brother than his father. The whole Theon thing… That’s really up in the air. He’ll have to do something pretty big to get back in people’s good graces. About the only thing he can do at this point is sacrifice himself to save someone. Could we finally see a Clegane match up? I hope we do, and I hope The Hound takes out the Mountain in a big, big way. Of course, this is all wild speculation. Can’t wait to see what happens! I’m going to come right out and say it. I think Tyrion is part Targaryen. 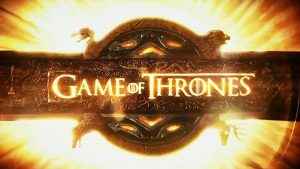 I’ve thought this since season 5, and only had a thin bit of evidence at that point: Tywin Lannister, before he dies says “Oh, …you’re no son of mine.” Before this, he did claim Tyrion has a Lannister, but grudgingly. …Like I said, pretty thin evidence. Wild speculation:Did Tywin call Tyrion his son, just to save face, because his wife had an affair with a Targaryen? What if the Mad king was Tyrion’s real father? And wouldn’t that make him first in line for the throne, if the Targaryens end up winning the war? Something that happened in season 6 gave a little bit more evidence to my Targaryen theory: Tyrion went into the holding area for the dragons and unshackled them. Now, before they were shackled these dragons had been out and about, torching animals (and children). They were locked up down there for a while… what was to stop them from outright torching Tyrion? Maybe it was because they sensed he was a Targaryen too, and that’s why he could get away with being so close to them. We’ll have to see if this theory is just blowing smoke, but if there are to be three dragon riders, I think they’ll be Daenerys, Jon and Tyrion. … The thing about those dragons though… If one of them dies, everyone better hope that the Night King doesn’t get control of it. Because if he does, it’s not going to be easy to deal with an undead dragon. Lots to talk about this episode! First, Daenerys gave off a distinct “mad king” vibe when she started going after Varys out of no where. It sure looked to me like everyone in the room was pretty surprised by her doing this, and I can’t remember even a hint of her being worried about this, at least recently. The only reason I can see that she talked about this at this point was that sometime before the end of the season Varys will either 1) really betray her trust or 2) do something to make Daenerys think that he betrayed her trust. If Tyrion isn’t around to talk her out of it, Varys won’t make it to next season. If that happens, Daenerys will definitely be on the path to be the “mad queen”. Speaking of crazy people, Sam’s got to be one of the bravest (or stupidest) people on the show. Trying to help Jorah get a cure for grayscale? Something that contagious – well, one slip of the knife and a splat of that goo onto Sam, and that’d be it. Sam sure seems to be doing all the wrong things: Stealing books from the gated section of the library, trying to cure Jorah when it’s been forbidden because of the danger. Sure seems like he’s going to get kicked out quick, or he’ll be the new celebrated figure at The Citadel. I’m guessing the former, because Maesters seem to be the “by the book” (if you’ll excuse the expression) types. 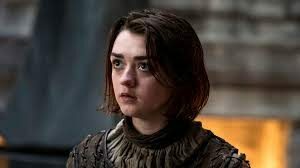 Arya’s headed back to Winterfell, and will end up missing Jon, because he’s headed to see Daenerys. The interaction with the direwolf was a set up for something that’ll happen later in the season. Arya’s words, “That’s not you”, with a little smile while she said it makes me think Arya believes Nymeria’s acting out of character. Anyway, it seems likely to me that Nymeria won’t be by Arya’s side while she travels up north, at least initially, but will be trailing Arya (with the rest of the wolf pack) to make sure she’s safe. The whole battle at sea with Euron and Yara, and yes, Theon, surprised me… I hadn’t expected that. I was under the impression at first the Euron was just out to get Yara. Turns out that was a bonus, because he was really after Ellaria, who was in the hold below. That’s the prize that Euron promised Cersei last episode. Last week I expected it would be Tyrion. How the heck did Euron know that fleet carried Ellaria? Theon jumping overboard was a surprise, but after thinking it over, it was really his only move if he wanted to stand a chance against Euron at some point in the future. If he’d have tried to kill Euron on that boat, I’m pretty sure Theon knew he would have died. I’m sure that Euron thinks he could take out Theon with no problem. He wouldn’t have needed Yara to entice Theon to fight. If Euron wanted Yara dead, he’d have killed her on the spot. Likely another prize for Cersei. Speaking of which… Did Nymeria Sand die? Or was she the one down in the hold with Ellaria? You did know that Arya named her dire wolf after her, right? Edit: Yup. Nymeria Sand, died. She was the one with the bullwhip.